Israel Houghton is considered a forerunner and architect of cross-cultural worship. He has written hundreds of songs for the church worldwide and is an award-winning producer and arranger. He serves as worship leader at Lakewood Church in Houston with Pastor Joel Osteen. Engaged in full-time ministry since 1989, Israel has touched the hearts of millions across the globe through his anointed, God-inspired music. With a desire to draw people of all races, ages and cultures together through worship, Israel and New Breed meld sounds and songs to create music that breaks down barriers and defies categorisation. Together with the vocalists and musicians of New Breed, Israel uses his own multi-cultural upbringing as a reference point. "It's not a white sound or black sound, it's a Kingdom sound," explains the songwriter and producer. All the while, this dedicated group of ministers continues to tour extensively and to serve at their local churches. 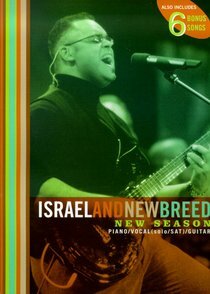 Israel and New Breed has achieved a synthesis of music and message that is electrifying and activating audiences inside and outside of traditional church walls. Most of their albums have to be recorded before live audiences to capture their singular infectious energy. Leader, singer, songwriter and multi-instrumentalist Israel Houghton has seen his compositions become integral components for progressive now-generation churches. Israel's story is remarkable in itself. Born biracial in 1971 to a white mother who was disowned by her family and abandoned by the child's father, Israel was given his biblical name from a word she saw repeatedly in the Bible given to her by the woman who ministered to her on the streets of San Diego. Not long after Israel was born she married Henry Houghton and they raised Israel and his three younger siblings in Arizona and New Mexico. An interest in music settled within him early on. "I was the kid in church who jumped on the drums at the end of service and annoyed everybody! But my mom is a phenomenal piano player who taught me the basics. And I learned the guitar on a bet from a guy who didn't think I had the discipline to do it. It was 1986 and I was 15 years old. Our bet was 30 days, and in that time I learned how to play practising every single day. I've always been like that about anything I set my mind to. I've always had this feeling that I'm not here to take up free oxygen. Whatever I'm here to do, I'm going to impact my immediate world and, hopefully, the world at large. It's just inherent." Israel is modest when it comes to acknowledging his musical gifts but his talent is clear from the sophistication of the chord and rhythm changes to the passion of his vocals. "My parents were pastors in a church in Santa Fe," he shares, "On Saturday nights we would do outreach programs with music and theatre. We'd take pop songs and change the lyrics to be more evangelistic - pop/rock/funky stuff from Journey to Stevie Wonder, though songs like "Don't Stop Believing" and "Love's in Need of Love Today" didn't need much tweaking. The musical training came from elbow grease after school." "I'm not a phenomenal musician," he insists. "I just make what I know work for me. But what I am good at is relationships - connecting with guys that speak a musical language. I've never been afraid of sharing the spotlight with musicians that are ten times better than me because it's not about me. It's about having a great encounter with God and a great experience."